It was late summer twilight in Los Angeles, and outside the trees would soon be taking on their autumn beauty. Inside the hotel room, I was listening intently to Shivkumar Sharma, but there was no CD playing the sunset raga, Puriya Dhanashri. Rather, the maestro himself, wearing a deep sapphire kurta, was sitting directly across from me, weaving elaborate and heartfelt responses to my questions. The tonal quality of his voice and the manner in which he speaks is quite wonderful, and the patience and humility he displayed was absolutely saintly. While groping to come up with some analogy, I realized that it is not an overstatement to say that Sharma is the musical equivalent of India’s architectural marvel, the Taj Mahal. The “spiritual high” he describes in the interview, a phrase I extracted for the title, is engendered by a prodigious intellectual imagination and supreme technical mastery married to an enlightened soul. The day before, we were treated to a twilight performance of the wildly colorful raga, Vachaspati, at the Skirball. Sharma was joined by his gifted son, Rahul, and the exquisite tabla artist, Ustad Shafaat Ahmed Khan. 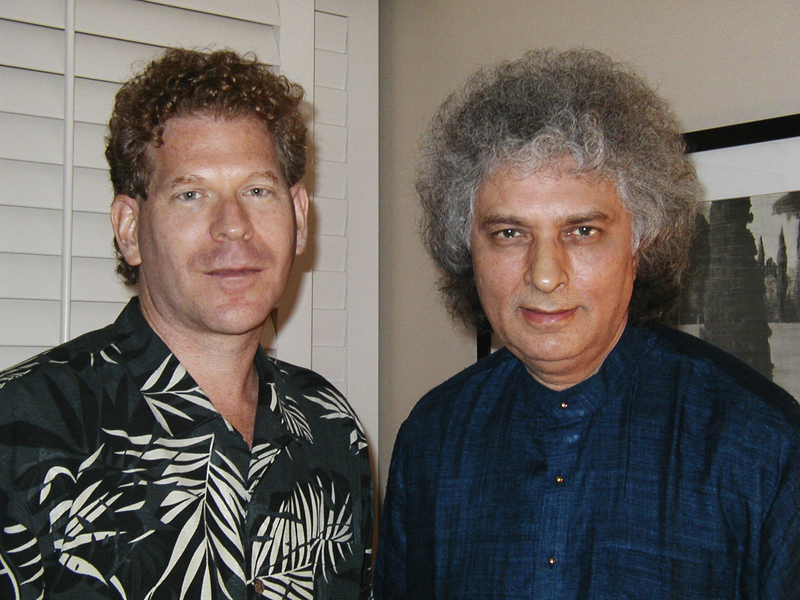 These two santoor artists playing together produces a fantastically rich musical tapestry, and it is frequently difficult to ascertain where Shivkumar begins, and where Rahul ends, so seamlessly are their phrases interwoven. It is uncanny how well they play together, and I eagerly look forward to hearing Rahul play a solo concert. Once again, searching for words, the pure snows of Sagarmatha come to mind when seeking to describe the sweet, sonorous tabla bols played by Shafaat. His variegated rhythmic phrases are as fresh as the streams flowing from mountain snows. 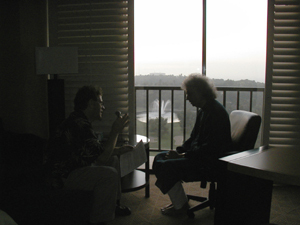 What follows is a word by word transcription of the interview. I have not superficially “corrected” the sentences and grammar, but rather have done my best to maintain the natural flow of our conversation. Antardhwani: The Song Within, is an original raga by yourself. I find it to be an exceptionally beautiful raga that has the same timeless quality as traditional ragas. You have stated that this is generally based on Bhairavi Thaat. I noticed that it has the same swaras as Chandra Kauns with an added komal rishab. Is that merely coincidental? It’s very interesting. Let me tell you actually how this thing happened, how this recording was planned. During that time, many of my listeners around the world were asking me to make a special recording for meditation, which could be used for meditation. Until then I didn’t know that many people were using my music for meditation. 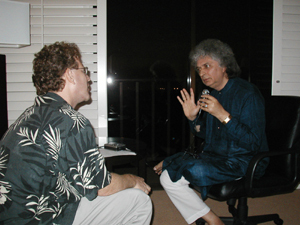 Many meditation centers, yoga centers, even people were using my music for healing. Wherever I travel I come across some different kinds of people. So this was a request. I started thinking, and this was a common request from everybody that there should be a recording without tabla, only alap. A couple of doctors also told me they have used my music, alap part, and it has given very good results. So there’s a record company in India called Music Today. They sometimes do thematic music, and different kinds of things. I just discussed this idea with them. So they were very much interested to record this type of music. OK. Till then I had never decided to create a new rag. In fact, I believe that there are so many rags already existing, and in one’s lifetime, a musician can have the technical knowledge of those ragas, but cannot master all of them. That is my personal belief. It takes a lifetime to capture the essence of few of the rags. I think perhaps that is the reason that most of the musicians have got their favorite ragas, because it takes lifetime to do that sadhana, to master these ragas. Sadhana means total dedication. Sadhana, the word, is actually used for spirituality. So that was not the idea initially. What happened, one day I was just practicing at home, and you know we, while playing one rag we change to another rag, we change certain tuning of the notes, although on my santoor I have got chromatic scale. Do you mean different tunings of the same swara? Different swaras. Although in santoor I have got chromatic scale. On the left side there are all minor notes. And right side of the santoor, where mostly we play, I tune according to the rag. The reason is the slight technique which I use for meend for alap. That is most suitable when you play on the same side. Tremelos are used to give a vocal quality in the alap. Yes. So in the process of going from one rag to the other, I just hit on this scale, and I got this scale accidentally. So when I played it, it sounded good! So I liked it, and I thought, OK, let me try to find out what are the possibilities in this scale. And then, for a few days, I was working on that. And then the aroha and avaroha, ascending and descending, was decided. I conceptualized that. So while ascending, the gandahar, third note, is not used. Sa, [komal] Ri, Ma, [komal] dha Ni. And while descending, all the six notes are used. In the rag there’s a particular phrase, certain swaras, certain notes, which creates that rag. I worked on that. Until then, whenever I used to play it, it used to give me a lot of peace. Those notes, the way I was trying to elaborate those notes. I don’t claim that I know each and every rag, but whatever I have heard and known, I felt this scale was different, the way it is used, and then, finally, it emerged in the form of a rag. I got in touch with Music Today. I said I think I’m ready with this, what we wanted to record. Till then, I had not named it because I wasn’t thinking on those lines, “OK, I’m going to create rag, and give it name”, and all that. It just happened. A couple of days before I was going to record it, I felt what kind of effect this rag has on me. I felt it takes me inward. It’s very inward taking music. So I named it Antardhwani. “Antar” means the inner self: the sound of the inner self. Antardhwani literally means that. Does the term “anahata nada” have special significance for you? Like ahata nada. Anahata nada is what the yogis and the people on the part of meditation. They try to listen to that. Anahata nada means a sound that is created without any effort. Ahata nada and anahata nada. Ahata nada is a sound made out of an effort; vocal or musical. Anahata nada is within yourself, you can hear it. There are certain kriyas, certain practice of yoga where you can hear that sound. I do, I do. Antardhwani, I felt, was appropriate for this. Now another interesting thing about this music is that after we recorded, it was only alap, jor, jhala. Then everybody in the studio felt this sounds so good, but this sounds incomplete. Then one had that urge there should be a composition. So initial idea was not to have any composition [chuckles]. So then I said OK, give me some time, and I’ll come up with some composition. So after I think a month or so, a couple of months, I recorded those compositions. The use of the pakawaj is a very nice contrast, and then later on, in the faster gat, you use the tabla. It’s a very nice contrast. Relating to what you just spoke of: you project a remarkable sense of transcendental detachment while performing. That is, while your body is clearly functioning in the material world, your thoughts and musical expression seem to be in the metaphysical world. There seems to be this to a very unusual extent. I believe this relates to what you just said before about yoga. Would you care to add anything to that? The sense is that you seem…you’re clearly performing, and technically it’s perfect, yet looking at you, you’re so relaxed, it almost seems like you’re not playing the instrument, and that you’re almost looking down on yourself playing the instrument [from above]. Almost like there are two of you. I think, I must say you are the first person, including me, who has rightly understood this thing. Because people sometimes ask me what do you feel when you play your music. What do you feel when you finish playing your music. But I think you have understood it. [chuckles] And it doesn’t happen everyday, but mostly, when I play my music, let me tell you what happens. I come on the stage. I’m conscious of the fact that I am playing for certain people who have come from near and far places. They have got certain expectations from this concert, and have got to finish my music within a certain period of time. But once I start playing, and everything is OK, there is no distraction, sound system is perfect, not distracting me, and everything goes well, then after a while I forget that I am on the stage. And music for me is meditation. And I don’t go on the stage, and I don’t make an effort that I’m an entertainer, I’m there to entertain people. I feel music for me is a kind of meditation, is a kind of prayer which gives me a spiritual high. It gives me a kind of bliss which I am sharing with the audience. And that is why what you saw. That is my approach to music, and that is how I feel, and maybe, I don’t know, that my expressions and all these things are different. Sometimes some people come after the concert, they’re sitting in the front row, and they say at that point of time, “You’re looking at me.” I say no. Maybe my eyes are towards some person, but its just, it was there, but physically I am sitting there, but I’m somewhere else. After the concert, if everything goes well, the most difficult part for me is when people come and want to talk to me. And especially sometimes people come and they are in a rush, and they want to interview me immediately after the concert. I’m not in a position to talk. It takes me a while to come back to this mundane world. After I finish concert, and I come back to my room, and then I can’t express the kind of joy, the kind of energy that goes in my body…when everything goes well, and music is…and then when I come back, then I start thinking OK, how I played, where I goofed up, what happened technically, what was not right. Those things come later on. I’ll move to another subject. Perhaps we can come back to this. For your tuning of the santoor, which is a beautiful part of the performance as you mentioned last night [at the beginning of the performance], you get into the mood of the rag, and the feeling of the space, and the time. The tuning is clearly very important to you. You’re very precise, and very carefull how you do the tuning. If Sa and Pa are absolutely fixed, are the other swaras - komal Ri, Ri, komal Ga, Ga, Ma, tivra Ma, komal Dha, Dha, komal Ni, Ni - are they tuned differently for different ragas? For instance the Ri for Darbari may be lower than the Ri for Durga. Is this true? Is this something you’re conscious of, or is it just a learned experience? I think by training, gradually we get used to these notes. Then when I tune a rag, I just don’t tune it Sa, Ri, Ga, Ma, Pa, Dha, Ni, Sa. I tune it according to the phrases which create that rag. For example, now I’m tuning Puriya. Ni, Ma, Ga, Ri Sa. I will tune Ni in according with the combination of Ma. [Sings phrases from Puriya]. I will play that phrase in my mind, and first tune those phrases, and see how Ni in combination with Ma sounds. Then you get exact Ni which should be used with that exact Madhyam. If you tune it individually, Sa, Ri, Ga, Ma, then maybe you’ll not get that exact microtone. So it’s all the relativity. Yes. So it’s not that this particular note now should be slightly lower individually. No. In combination with other notes which create that rag. That’s what I suspected, that it has to do with the expression rather than an abstract scientific ratio. Yes, this is how I personally do it. And I think there is some similarity in the chord systems in the Western music. And the notes we use, the vadi, samvadi, is always the fourth note or the fifth note, Sa-Ma, or Ri-Pa, or Ga-Ni. And if you play both together, suppose in our music we do that, as it is done in the Western music, there is some relationship between these things, about the vadi, samvadi of Indian classical music. This is, personally, I don’t know, somebody has done research about it, and what it is. You know, vadi, samvadi is very important, and this has got some relationship with the harmony it creates. So when I tune a rag, of course, to see the exact tuning, first I tune Sa, and then higher Sa, and the lower Sa, three Sa I have got. Now suppose I am playing a rag in which Pancham is used, then next note I will tune is Pa. Suppose if I am playing Bageshri. After tuning three Sa, the next note I will tune is Ma. Then the next note I will tune is Dha. [Sings phrases.] Then I will tune Ga and Ri. I’ll play that phrase while tuning. And in relationship to other swaras I tune it. And when the tuning is done like that then you are getting the exact microtone of that rag. And if you tune Bageshri like Kafi - Sa, Ri, Ga, Ma, Pa Dha, Ni Sa - maybe you will not get the correct Gandhar which is used. I suspect this is one of the elements which differentiates the very top maestros like yourself and Zakir Hussain, and Hariprasad and Pandit Jasraj, from the very good musicians. My sense is that their [musicians other than the very best ones] sense of tuning and rhythm and melodic development is not quite as acute as the very top musicians. Is this something you can add something to? Also, the expression. For instance, when you play the santoor you get a very full tone without playing loudly, and I think that’s a beautiful thing. I think some musicians, whatever instrument it might be, might play louder, but you can get a full tone without playing too loud. Of course, you can play loud if you wish to. Yes, yes. Dynamics is a very subtle thing. It needs that sort of understanding. Now it’s a staccato instrument, santoor. So it’s more difficult to give expression to staccato notes. That is where how you hit that particular note, and where. If it is near to the bridge, the sound is sharper, and more bold. If you just go away to the left of the bridge, in the center, the sound is different. There are very subtle things. Yes, graduations of tone color. Yes. Dynamics, how you create that. That’s very important, and I think that comes with a lot of experience and thought, and all that. Yes, yes. Sawai Gandharv Festival is one of the most prestigious festivals in India, and this is organized by the legendary vocalist, Pandit Bhimsen Joshi, in memory of his guru. Sawai Gandharv was the name of Bhimsen Joshi’s guru, and in his memory last year they completed fifty years. I performed last year in the morning session, and this ambience is different. It’s in the open air. Sometimes it could be distracting compared to an auditorium, which is air conditioned, soundproof, no other sounds. Here it’s in the open, and the number of people ranges from ten to fifteen thousand. They stay on all night, and sometimes the crickets, they also come [laughs]. They have their own session. So it could be very distracting. They started doing this live concert recording, and naturally they captured the sound of other music going on. But when we start playing, and the kind of audience is there, and the kind of reaction we get from the audience, no matter if there is some distraction, the musician forgets that. And this music, as I said, is not fixed music that whenever we play we’ll play the same thing, of the same quality, of the same level of performance. It varies, and the quality of music largely depends of the receptivity of the audience. How are you feeling when you come on the stage, how people are receiving it. That is why festivals like Sawai Gandharv are a special place for musicians to go and play there, and amongst the listeners you might find Pandit Bhimsen Joshi himself sitting there, and many other young musicians, music students, they’re sitting on the floor, squatting on the floor, and it creates a different kind of atmosphere. I wanted to ask you: one thing which I feel enhances your performances – the clothing you wear. I hope this is appropriate to ask. It’s really…I’m not even sure what the shirts you wear are called [kurta], but they’re always exceptionally fine, and the colors have…I think they enhance the music. Do you have your clothing custom made, or a special favorite place you go to? [Chuckles] Actually these kurtas, these cloths are selected by my wife, Manorama. Like the one last night [a swirling pattern of red and orange hues], I’ve never seen a pattern like this, and it seemed to be very appropriate for the sunset, it seemed to have sunset colors. Yes. So the cloths are selected by her. Manorama is her name. And I have got a person in Bombay, Mod House Creations, and he designs it. Actually he works for Bollywood people, movie stars and all that, but those cloths are different, what they use for shooting and all that, but he designs, but a lot of input is given by my wife who selects the color and kind of cloth and all that. Might the colors have any connection to the time of day you’re performing? Or just the way you feel? Yes, just the way we feel, and yesterday in fact, we just arrived from San Francisco, and we hardly had time to have a bite, and just get ready, and I just picked up this kurta, what I was wearing yesterday, but it went OK.
Do the gold chains and rings you wear have any special significance, perhaps from your guru? It has a special significance. I’m very fortunate that I’m blessed by Sathya Sai Baba. I don’t know whether you have heard about him. So I have been going to Baba for more than thirty years, so time to time. We believe he’s an incarnation. That is the kind of experience I have got all these years. Experience of this kind. For example, I’ll give you an example. I’m talking to you now. He’s sitting in Southern India somewhere in a village. He lives there. It could be possible if I meet him after three months, he will exactly narrate that Mike asked you this question, and you answered this. This is what I have experienced. His omnipresence. And there are umpteen number of experiences which I personally went through. And these rings, what I wear, are materialized by him. Now this is something which people who have not experienced will never believe, so mostly I don’t discuss it. But you have asked me this question. So materialized means created from nowhere. These two rings are materialized by him. … and this could be an emerald? This was materialized on Baba’s sixtieth birthday when I performed there. He loves music. And this is which he has changed number of times. I don’t know the name, and the two chains I wear, again are materialized by him. So it’s not…I’m not actually fond of wearing these gold things and all these ornaments, but this is a blessing from him. So this is… because after my performance mostly all these things I got. So when I perform, I feel his presence, and I wear it, especially at the time of performance. What are your feelings toward mortality? Do you believe in reincarnation, immortality? Do you have any thoughts on this? Are they identical to what traditional Hindus believe? My belief and my background had been like this. No, there is a difference between being a religious and being spiritual. I may not be so religious in my day to day behavior. I may not be doing the rituals. The religion is a beautiful thing, but sometimes it’s misused, it creates so many problems also. But common factor is if you forget about that religion, the spirituality, the self is same. For example, I have done some sadhana on the spot also. I’m trying to know myself. A seeker of this path asks himself the question. “Who am I?” Spiritual path, “Who am I?” So the question normally in a mundane way is, “I’m Shivkumar Sharma.” But “Shivkumar Sharma” is this body. Not the Self. “Shivkumar Sharma” is the name given by my parents to this body. This body is perishable, but the Self is not. So Self is immortal. That never dies. Like, I can, now I’m wearing this kurta. I can change to another outfit, can change this outfit of different type, but this body remain the same. Same way, the Self, which is wearing this body can change this body number of times but remain the same. And this is the first question, who am I? So I have so far, now I’m going to be sixty-six, completing sixty-six in January. I have at least understood this meaning very clearly that “Shivkumar Sharma” is this body, not the Self. And I’m trying to go further, and know from where this Self it comes. That also I know. For example, we all come from the same source, no matter what religion you belong to, what religion I belong to, where we are born, what kind of language we speak, what kind of food we eat, but there is a common factor. Now suppose, there is electricity. Electricity comes from a power house. But electricity has got different shapes and forms, and different effects. Electricity can give you cool air when it’s used in air conditioning. It can give you heating when changed. It can give you light of one-thousand power bulb, or zero power. It can run factories. It can do so many things. But source is same. It is electricity. It’s not water. It’s not air. It is electricity. That factor is common. So, now all of us, we have got different colors of skin. We speak different languages, although we have got same kind of limbs, all human beings. But all living beings, no matter if it’s lion, or mouse, or tiger, or sparrow, or whatever, or human being, one thing is common: the soul is connected to the same power house which is the ultimate power, spiritual power. You call it God, I call it Bagwan, Muslim call it Allah. So this is from where I have come. Now there are so many unanswered questions about this factor, and I’m trying to get those answers. And when I play my music, I try to go inward, and I try to go towards this path through music. Because in the ancient times, when you want to know many things you have to meditate. There are different ways of meditation. Yoga is one thing. Yoga is not only physical exercises. Yoga is much more deeper. And yoga takes you towards this path. Do you practice yoga everyday, or when you have time? I try to do it everyday. And then these are different means and ways of finding the answers to these questions. And in the ancient times, seers, sages, they tried to find different means, and one of those things was sound, the chanting of hymns. That was the very beginning of the Vedic period. The Vedas say the universe began with a sound. With a sound. And in India we say Nada Brahma. Sound is God. And this is the accepted fact that the universe started with sound. And out of that sound there are two ways, akshara and swara. Akshara means language. There are mantras, we call then Bij Mantras, and the greatest Bij Mantra is AUM. That doesn’t belong to any particular religion according to me. There are seven chakras in our body. When you say AUM [chants a deep, resonant AUM], it starts from here, it goes up, and then these vibrations of this sound, they give you energy, they hit on your certain chakras. And that was the significance, that through this chanting of this sound, something happens to your body, your chakras are awakened, and you are lifted to another hemisphere, you experience different things. So sound was used for meditation. Again, to go towards that direction. And then came chanting of mantras. And even if now you come to India, and if you listen to these priests chanting the hymns, they have got three notes [sings the notes]. These notes are used. So there were not seven notes. I’m just explaining how this music started. It started from a smaller kernel. Yes, and that is why the origin is sound. The origin of the world is sound. So in a sense, Indian classical music can be an exploration of sound. …which is still going on. Yes. So then after centuries of research work, and all this, we got this present music, the rag system, and all that. But it was sound, and it was used only for meditation. So we’re trying through our music to find out the answer to many questions. Do you have any other special interests outside of music and yoga and devotion? Hobbies, or what type of exercise do you do? [Chuckles] I mainly do some yoga exercises. I do some pranayam. Pranayam is breathing practices, which is again yoga. There are different types of pranayam, breathing systems which help you. And besides that, of course, spiritual things, philosophy and all, I’m interested in that. And then the lighter side of life is very important. I like to have a good laugh [We both laugh]. I think the spice of life is to have sense of humor. That is very important. And sense of humor means you can laugh at yourself. And I observe people. And two things that observation gives me: sometimes we are traveling together, I, Rahul, Shafaat or Zakir, and we would see somebody, and you know, sometimes there is some similarity in faces. People living in different continents, sometimes there are some similarities, and we look, and sometimes we have a good laugh. And sometimes when I meet different people, there is another of my hobby. I feel God has given some kind of gift to every human being. And when I meet somebody, I talk to somebody, I try to observe what are the good points, or some special thing this person has got which I can imbibe. I can learn something from that. And I meet a person with this intention in my mind, that you can learn so many things from so many people, if you just observe them. What is…is there one single thing which you would say is the most difficult thing to teach your students? What is the most difficult thing to convey to your students? I tell you one thing. My feeling is, normally people say in India, and maybe in the West also, but in India mostly, whether it is spiritual path, or it’s music, or any art form, the shishya, means student, is always in search of a good guru. This is what normally, because shishya, what shishya is seeking, to get a very good guru who can guide him. I feel the other way also. Guru is also in search of good shishya, which normally he doesn’t get. And if he gets, that’s a joy for guru, to teach that student. And because if the shishya has got the capability to understand what I’m teaching… sometimes I’m trying to teach three, four students together. There is one who is immediately connecting with what I’m saying, and others are just groping in the dark for hours, and are not able to understand that. Again the difference comes from the previous experience. Previous experience means not of this body’s experience: previous birth experience. So guru is in search of a proper shishya. Proper shishya is who has brought some karmas from the previous birth, so he connects immediately with your thoughts and ideas. Only that much is not sufficient. Then shishya must have total dedication. Suppose there is a shishya who is very talented, but doesn’t have the will or inclination to work hard. Then it doesn’t work. There’s a Western expression, I don’t know if it’s also Indian, that genius is ninety-nine percent perspiration, and one percent inspiration. Have you heard this? [Laughs] Yes, yes. That’s very true. So it’s a combination of so many things: dedication, total surrender. And then, when one learns everything, and is ready to come on stage, and is doing well, the most difficult part starts then. Because when you go on the stage, and you perform, whatever you are doing, whether average, ordinary, extraordinary, some people will come and praise you, “Oh, it was great!” Whether you have done average, ordinary or extraordinary. But some people will be polite, and they will come to an average, an ordinary performance or so, “It was good!” That goes to your head, “ Oh! I am great!” “I am being praised.” And then the problem starts. The growth stops. If you start thinking “I am great.” Because then you’ll not seek something better. That’s one thing I was planning to ask you: how do you maintain a sense of humility, a sense of balance, if when you reach the heights, when people refer to you as one of the absolute greatest musicians in the world, yourself and a few others, and I think you’re speaking of this, how do you maintain the humility? Is it because even the greatest human being is still humbled in the face of Nature and God? Yes. How I handle it personally, and this is the training I got from my father and guru besides music, and again it’s connected with the spirituality. So how I handle this thing, this praise from different quarters. This, again, I got from my father and from my guru. The spiritual training. That is, if I look at it, look back in time, fifty years ago the name “santoor” was not known outside the area of Kashmir, not even in Jammu, which is the winter capital of our state. Forget about rest of India. And nobody had seen this instrument. And when I started performing there was, I think, hardly a musician, I don’t know another musician who would have faced this situation that people totally discard. Certain quarters, they said “No, it’s impossible to play this classical music on this instrument.” And some people advised me, “Still there is time”, some very knowledgeable, very famous musicians, they told me, “You are a very well trained musician, and you are a very intelligent musician.” “You have chosen the wrong instrument.” “Still there is time, give up this instrument.” “And the training you have got, the kind of musicianship you have got, if you play sitar or sarod, you will become famous, but not with this instrument.” “Give up santoor.” So this was the situation. And where santoor is today, I think it’s nothing short of a miracle. And it’s enough to make a man mad if one starts thinking, “I have done this.” It never comes to my mind, whatever happened with santoor, that I have done it. I honestly, even in my own thoughts, forget about talking to other people, that we talk in mundane way, “OK, I played this, and I create as well.” I was explaining to you what I do, how I tune. But in my mind, I know very clearly, I’m just an instrument, I’m just a medium. God chose me, a medium, to create this music through me. I’m not doing it. This is, I got the training from my father, and then I experienced, I realized it. When I go to a concert, I do my meditation, and I pray before the concert. That’s why before the concert I need some time for myself. So I should be alone in my room, and I do some meditation before I leave. And I pray that it’s in Your hands, You have to do this. To help. And I totally surrender myself. So this music happens. I am not doing it. And that is why when you rightly watched me on the stage, and felt that thing. Because I honestly believe some supernatural power, no matter what we call it, God, Bagwan, Baba or anyone, is doing this through me, and credit goes to Him, not to me. And when I think, when I come back, again I meditate when I’m alone, and I thank, “Thank you very much for making me a medium to do this.” I’m not doing it. And I’m still learning. I’m still a student. I’m learning from each of my concerts what better…. Sometimes, you know, Mike, I have discovered something which I had never learned, I had never practiced, I had played it on the stage. And it clicked, “Oh, my god!” “This is possible!” “How is this possible?” “How I could never know it?” And then I come back home, I sit with my instrument, I start developing those ideas, and create something different. So this is how I feel. And even when I’m teaching my student, I learn something different. So learning process never ends. So I’m always a student. I imagine playing with different tabla players, great tabla players, Shafaat, Anindo, Zakir, each is, I imagine, is a different experience, which brings out different elements of your musical personality. Is that true? Swapan Chaudhuri I have played a lot. I have never… I would love to hear that combination myself. But maximum, I have played with Zakir. And we together, Zakir, the way we connected, and the way Zakir understood my music, and created a style of accompaniment of tabla with santoor. So I think Zakir did something extraordinary. Yes. An extremely wonderful combination. In fact, I was going to say, in terms of consistency, that yourself and Zakir record and perform at an exceptionally high level, even for great masters. No, each one has got their own style. [Keeping the focus on tabla players.] They are great in their own way. Every tabla player, old masters, and the present great tabla masters. But there are certain things, you know, there is a rapport you have with certain person. So with Zakir it’s a different kind of, I don’t know, tuning. So Shafaat has played a lot with me, he has traveled all over the world with me, he has played a lot of music, and he has shaped so well during all these years. Shafaat played with me for the first time when he was about fifteen years old. And I think Zakir played with me for the first time when he was also fifteen, sixteen years old. So Anindo played quite later, and Swapan played later. But they played, Zakir, very young age with me. Yes, so they played a lot. And Zakir is a very special musician. He’s not only a tabla player. He’s a thinker, he’s a musician, he’s full of music. OK. This is more than I imagined. Special thanks to Milind Joshi for arranging this interview to take place, and for taking the photographs.